Get a behind-the-scenes look at a Bangalore slum on a 4-hour tour that highlights solar lighting that improves quality of life for slum residents. Gain insight into the potential for social enterprise and solar lighting in India, and meet a local family who welcomes you into their home. Bangalore is one of India’s most cosmopolitan destinations, however the city also has hundreds of thousands of people that live in shanty-style tent homes without running electricity or water. 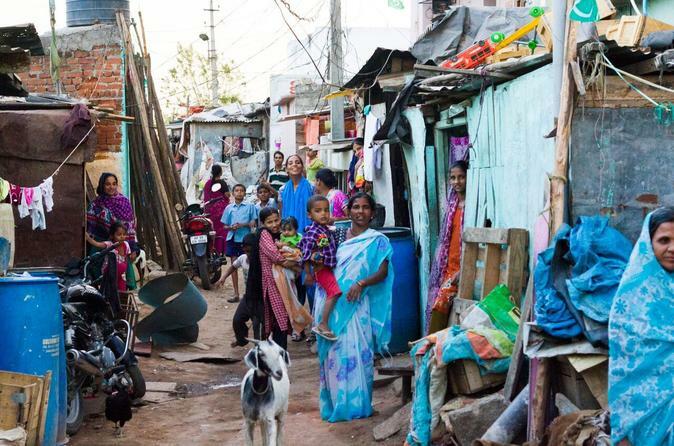 Experience one of these Bangalore city slums with a host from Pollinate Energy, a social enterprise that provides solar lighting to India’s urban poor. Learn how the enterprise operates with local people who run a solar lighting micro-business that helps families replace polluting kerosene lamps with clean burning solar lighting. Start your tour at the Pollinate Energy office where you'll hear about the organization's origins, growth, and future plans. Next, have lunch at a local restaurant, then ride in an auto-rickshaw through busy city streets to a tent slum on the edge of the city. Your guide takes you into a tent community to visit the home of one of the customers. Sip chai with a local family as the sun sets and the lights switch on, witnessing how the solar light makes a big difference. When finished, hop back in the rickshaw to return to the city where your tour ends at your starting point.